Our 16 day adventure through two fascinating countries begins in Kiev, Ukraine's capital city, which is situated on the banks of the Dnieper River. The city has been inhabited for almost 2000 years and was once the capital of the Kievan Rus State, from which all later Russian states were descended. Although Ukrainian nationalism is stronger than ever, you will still hear Russian spoken widely here today. The city is filled with attractive architecture, wide shopping boulevards with coffee stands every few metres, parks where the locals stop to feed the squirrels and play chess, and a mix of high-end department stores and a warren of underground malls selling everything from hot corn on the cob to traditional ceramics. Kreshchatyk is the capital's main street and stretches from the traditional food market of Besarabsky to Maidan Square, where the 2014 revolution took place, which resulted in the country's president Viktor Yanukovych being overthrown and fleeing to Russia. You'll find a selection of good restaurants and bars to choose from this evening. Ukraine is well known for its dumplings, called varenyky that come with a range of different fillings such as mutton, cabbage or sweeter varieties like cherry. You should also try nastoyanka, which is a Ukrainian liqueur made from honey and herbs and comes in a selection of fruit flavours and even horseradish! Potential dining spots include Spotykach Restaurant, which is a retro Soviet style canteen cellar or for something quicker you could try the local fast food at Kyivska Perepichka, which specialises in fried dough encased sausages. We have a busy day today, as we aim to discover a selection of Kiev's many historic sights and to get a feel for this great city. A local guide will show us the highlights including the Golden Gate which was once the main entrance to the city, Saint Andrews Baroque church and the onion domed exterior of Santa Sophia Cathedral. The cathedral is the city's oldest remaining religious building and inside we'll have the chance to see mosaics and frescoes that date back to 1017. This afternoon we take the metro to Arsenalna, which is the deepest station in the world. We continue from here to the Museum of the Great Patriotic War, which is one of the largest museums in Ukraine and tells the story of the German-Soviet War in iconic and Brutalist style. It has over 300,000 items on display and the memorials are spread over 25 acres. We will be able to see the huge Mother Motherland statue, which is 100 metres high and was built to honour the heroes of the Soviet Union. We make an early start this morning (normally around 7.30am) and begin our drive to Odessa on the Black Sea coast. We'll pass by a variety of interesting scenery and towns along the way, have the chance to grab lunch in a local restaurant, and break our journey with a stop at the extraordinary Strategic Missile Force Museum at Pervomaysk. In total today the drive will take us around seven hours and we won't reach our hotel until dinner time this evening. We have a guided tour of the Strategic Missile Force Museum, which before being decommissioned was an actual nuclear weapon launch site. We will see the most powerful Cold War Soviet missile - the R-36M2 'Governor' bomb which was nicknamed 'Satan' by the Americans. We also descend down in a small lift to the original control room - the Unified Command Post (UCP), which is three metres below the surface and part of 150 metre long tunnel complex. We arrive into Odessa this evening. Odessa is a character filled port city with tree lined streets and colourful buildings. Although it's on the Black Sea coast, the city has an almost Mediterranean feel to it, as in years gone by thousands of immigrants from all over Europe were invited to make the city their home and brought their own architectural styles with them, including Neo-Classical, Renaissance and Art Nouveau. We'll have a three course dinner at Kumanets Restaurant (or similar). Kumanets is known as grandma's house and is decorated with traditional Ukrainian furniture and colourful trinkets. The food is hearty, with dishes such as rings of homemade sausages, herring with onions and real Ukrainian borsch soup with donuts and salo. We set off this morning with our local guide on a walking tour of Odessa. We will wander down the tree-lined Primorsky Boulevard, see the many steps of the Potemkin Stairs leading down to the seafront, the beautiful Opera House and Palace of Count Vorontsov, and a few of the more unusual highlights like the Mother-in-Law Bridge, Devil's House and Monument to the Orange Tree. The Devil's House is an especially interesting building; when times were hard the owners of the land didn't have enough money to build a house with four walls, so they built it with three. When looking at the house it creates the optical illusion that the house only has a front wall and like it shouldn't be able to remain standing, which has given it the nickname Devil's House. After our walk this afternoon is free for you to continue your own explorations. You may choose to take a trip with a local guide down to the world's largest network of underground catacombs and learn of their fascinating history through the ages. Today is free for you to enjoy the city and to relax on one of its popular sandy beaches. Alternatively there are a number of different excursions that you might like to join. You could visit Coastal Defence Number 411, which is now an open air museum and a Memorial for the Heroic Defence of Odessa during World War II. Here you can see an armoured train, artillery guns, an Odessa tank (armoured tractor) and a post-war submarine. You may like to join a day trip to Dniester National Park, which is around 50 kilometres drive from the city. During the days of the Soviet Union the Dnieper River was in a poor state. It was over fished, used for irrigation and hydropower, dredged for sand and in 1983 it suffered one of the worst environmental disasters in recent history when a liquid-waste reservoir collapsed and over 4.5 million cubic meters of toxic brine was released into the river - killing wildlife and polluted drinking water. It took years to recover, but now the river estuary is protected. You can enjoy a bird watching boat trip across the wetlands to see some of the 1,500 species of flora and fauna found in the delta. The national park is best known for its birdlife with 254 species found here, including 11 on the endangered list. You may spot pelicans, spoonbills, egrets and glossy ibises amongst others. For food lovers and bargain hunters you could enjoy a trip to three of Odessa's most famous markets. The Flea Market selling many old Soviet items; Privoz the bustling food market best known for its fresh fish and the Seventh Kilometre Market, which is Europe's largest outdoor market and built out of a maze of shipping containers, which sell everything you could possibly imagine from wedding dresses to leather goods and from ceramics to telescopes. We depart this morning at around 8am on our drive to Chisinau, the capital of neighbouring Moldova. Along the way though we'll get to experience one of the most unique places in Europe - Tiraspol, the capital of the breakaway state of Trans-Dniester. It will be quite a long drive and the border crossing can take time. In total the journey will take us about seven to eight hours and we won't reach our hotel until dinner time this evening. Unlike the rest of Moldova Trans-Dniester hadn't wanted to separate from the Soviet Union, so back in 1992 after a short conflict they declared their independence. However, it's not recognised by any of the United Nations as an independent state even though it has its own government, military, postal service, currency, flag and national anthem. On arrival we have time for lunch before going to the Kvint Brandy Factory for a tour and tasting. Kvint is considered by the locals to be a national symbol of Trans-Dniester and even appears on one of their banknotes. It was founded in 1897, making it the oldest operating commercial enterprise in the region and as well as brandy the factory produces wine and vodka. Next we'll go on a guided walking tour of this fascinating city to view the numerous war memorials including those commemorating the 1992 Civil War and Trans-Dniester War, and the Supreme Court, Statue of Lenin, De Voln Park and Arch of Bendery. We'll have a little free time to look around Tiraspol before we drive on to Chisinau and check-in to our hotel for the next two nights. Located in the very heart of Moldova, the city has a chequered history, which dates back to 1420. However, most of it was destroyed during World War II and an earthquake in 1940, so the architecture is mainly in 1950s striking Soviet style, but there are also two large parks, which give the city a much greener feel. You will find the Moldovans to be some of the friendliest people in Europe and nowhere is that more obvious than in Chisinau. This evening we'll have a three course dinner at the Propaganda Restaurant (or similar). Propaganda is designed to resemble a Soviet era apartment and the food consists of traditional Moldovan dishes with a modern twist. We begin by exploring Chisinau on foot with a local guide including the Orthodox Cathedral of Christ's Nativity, Presidential Palace, Parliament building and the Holy Gates, which are known as Moldova's 'Arc de Triomphe'. We also visit the local bazaar and Stephen the Great Park and Monument. Stephen the Great was the Prince of Moldavia who reigned in the 15th century and gained popularity for successfully defending the country from the Hungarians, Polish and Ottoman Empire. We'll join the locals promenading down the Avenue of the Classics of Moldavian Literature, lined with statues and busts of Romanian and Moldovan authors and social figures. We will have the opportunity to visit the emotive Army Museum in the Centre of Culture and Military History. The exhibits here document Soviet-era repression and the crimes perpetrated by Lenin and Stalin. They tell the story of mass deportation, gulag labour camps, manmade famines and other harrowing tales. This afternoon we leave the city and drive into rural Moldova to Orheiul Vechi. The site is of great historical and archaeological importance and is home to one of the most unusual church complexes in Eastern Europe. Set in a ruggedly beautiful valley gorge, shaped by the Raut River, there are several ancient monuments amongst and carved into the huge limestone outcrops that date from 10 century BC up to 14 century AD. The Cave Monastery was dug into the cliff by Orthodox monks. Before returning to the city we will enjoy a traditional Moldovan dinner of dishes such as zeama - a tasty chicken soup and mamaliga - a type of polenta with fried meat and fresh seasonal vegetables washed down with homemade wine. During dinner we have the chance to see and join in with traditional folk songs and dancing. Today we leave early (between 7-8am) as we bid farewell to Moldova and begin our drive back into Ukraine and our explorations of the west of the country starting in the characterful and often overlooked city of Chernivtsi. The drive today will take about six hours including time at the border crossing. Chernivtsi is a lively and ramshackle city with a mix of renovated and partially ruined buildings and different architectural styles including grand old Austro-Hungarian houses, which reflect the decadence of days gone by. The city is six centuries old and used to be part of old Moldavia (now Moldova) and was known then as Bukovyna (Beech Tree Land), it was later in the Habsburg Empire and for a brief time after World War I it belonged to Romania. After time for lunch we will take a walking tour accompanied by a local guide to Ringplatz Square, Theatrical Square, the Palace of Culture, Philharmonic Square, the Square of a Turkish Well and probably the cities most impressive attraction - Chernivtsi National University. The UNESCO-Listed red bricked buildings are a wonderful mix of Byzantine, Moorish and Hanseatic wings. It was constructed in 1882 for the Orthodox Church leaders as their official residence and became a university in Soviet times. This evening we'll have a three course dinner at the traditional Ukrainian restaurant in our hotel. You are free today to relax and enjoy wandering around the scenic streets of Chernivtsi or perhaps you'd like to join a full day excursion to the town of Verkhovyna in the Carpathian Mountains. On arrival you will visit a local farming family to learn about how they make traditional Carpathian Mountain cheese such as brynza, vurda and budz and of course to sample some of them. Next you'll be met by a local guide who will take you on a short hike and will explain the history of the region along the way. The hike is moderate difficulty with a few steep ascents and descents; it'll take around 1.5 hours and cover about two kilometres. You'll then visit a privately owned museum dedicated to the Hutsul life. Hutsul's are a local indigenous people who have their own unique culture and customs, which can be seen in their colourful and intricate craftsmanship including clothing, metal work and wooden furniture, and traditional songs and dances. You will get to hear a song played with a Ukrainian national instrument - the trembita, which is a type of long wooden horn. Lastly you will go to a local kolyba, a Hutsul restaurant before returning back to Chernivtsi later this evening. Alternatively you might like to take a full day trip to visit three of the Caves of Ternopil - Crystal Cave, Verteba Cave and Monastyrok Cave. The labyrinth of over 100 caves and tunnels found in Ternopil stretch for over 600 kilometres underground and are known as 'the kingdom of eternal darkness'. Each of the caves has its own characteristics and the three we visit are very different to one another. At Crystal Cave you can see uncut gems covering the walls, in Verteba Cave there is a museum with sculptures and ceramics on display, and lastly in Monastyrok - Monastery Rock Cave you'll see an Orthodox church built into this natural grotto. This morning we drive to Kamianets-Podilskyi and on arrival we will take a guided walking tour of this pretty city. The architecture and culture here has Ukrainian, Polish, Russian and Armenian influences. We'll get to see both Alexander Nevsky and Saint Peter and Paul's Cathedrals, the Town Hall, Muslim minaret and more besides. As well as visiting the city's most famous monument, the stunning Old Castle of Kamianets-Podilskyi that dominates the skyline. Ukrainian poet Lesya Ukrainka described the medieval fort as 'a flower on stone' due to graceful appearance. Set on river loop this powerful defensive complex has protected the city for centuries before becoming military quarters and then later a prison. Today much of the fortress remains intact and is part of the National Historic and Architectural Reserve and exhibits explain its history through the ages. We have time to stop for lunch in a local restaurant near to Khotyn Fortress before visiting this more compact 10th century fort with our guide. This castle is also very well preserved due to its excellent defensive position beside the Dniester River along with its eight-metre thick walls and five lookout towers. We return to Kamianets-Podilskyi where we spend the night and you have the evening free to have dinner. We leave Kamianets-Podilskyi this morning and head towards the beautiful city of Lviv. Along the way we stop at the small town of Rohatyn to visit one of the oldest wooden churches in Ukraine, the Church of the Holy Spirit. On arrival in Lviv we discover the history and stunning architecture of the old quarter on a guided walking tour. Along the way we will see the old market square of Ploshcha Rynok, the ornately carved exterior of Boyim Chapel, the Dominican Church and Monastery and the Citadel Inn. The inn was originally built in 1850 as a circular red fort that during World War II became a Nazi concentration camp and was known as the 'Tower of Death', but today it has remarkably been turned into a five star hotel! We also see the Old Rus Quarter of the city and the High Castle, which affords great views over the city below. Lviv is home to not just one, but three different cathedrals; there's the Latin Cathedral, Armenian Cathedral and Saint George's Cathedral and they all vary greatly in style. This evening is free for you to have dinner and Lviv is the perfect spot for relaxing. In amongst the cobbled streets with their pretty red roofed buildings and tucked away courtyards you will find a variety of good cafes, bars and restaurants. One dining option is the Dim Legend Restaurant that is spread over seven small floors and a roof terrace and each floor is decorated with a different theme telling the city's history through the ages. Today is free in Lviv for you to further discover the city. Lviv is well known for both its beer and chocolate, so you may choose to visit the Brewery Museum or join a chocolate making masterclass. Alternatively you might like to visit Lychakiv Cemetery. This burial ground is a protected historical monument and believe it or not is one of the most popular attractions in the city. Established in 1786 by the Austro-Hungarians, there are grave markers here written in Ukrainian, Russian, German, Polish, Armenian and Latin, which show how the city's rulers have changed throughout its history. In amongst the elaborately carved tombs there are also communal graves for soldiers and freedom fighters and simple communist graves. Sadly during the Soviet era the graveyard was used as a dumping ground and only reopened in 2005 after being restored. You could join the Tour of One Street which takes in three of the city's sights, starting at the Neo-Baroque palace which we built in 1867 by the architect Adolph Kuhn as the home of Prince Leon Sapieha who was part of the Grand Duchy of Lithuania dynasty. During Soviet rule the mansion was turned into a school and it was later restored in the 1990s. Next we see the Memorial Museum dedicated to the victims of occupational regimes on Lontskoho Street. We can learn about the punishments and conditions dished out by three occupational powers: Poland, the Soviet Union, and Germany to the political prisoners that were held here. Lastly the tour will also show you Lviv's Citadel building. Later this evening after we've had time for dinner we go to the train station to board our overnight train to Kiev (departing at around 11pm). We will use sleeper carriages with four bunk beds (two beds on floor level and two above) per compartment. Bedding will be provided and there is a shared toilet and wash basin in each carriage. Early this morning our train arrives in Kiev (at around 6.45am) and we will have breakfast in a local restaurant near the station. After this we'll take our bags to our hotel to store in their luggage room, as we won't be able to check-in until later this afternoon. After a chance to freshen up in our group shared day rooms we'll go to visit the Chernobyl Museum with exhibits that are designed to teach us the scope of the nuclear disaster and to ensure that the lessons learnt from this terrible accident aren't forgotten. It'll help to provide us with some of the background information ahead of us visiting the Exclusion Zone tomorrow. The rest of the day is free for you to further explore the city or you might like to join an excursion to the Mezhyhirya Residence Museum, which is the lavish property where Ukraine's controversial former president Yanukovych resided before the 2014 uprising. Or perhaps you'd prefer to visit the Pyrohiv Open Air Museum, which exhibits a range of historic wooden buildings that demonstrate traditional Ukrainian architecture and what life would have been like in bygone times. Alternatively you may choose to visit the Lavra Historical and Cultural Reserve to see the remarkable 'Monastery of the Caves' founded in AD 1051, where the labyrinths provide all the natural conditions needed for mummification. When the monks first dug into the ground they discovered the soil was rich in silver and so this helped the monastic complex to grow in size and today we can see the huge number of ornately decorated buildings that were created. This morning we set off on our exciting explorations to the Chernobyl Exclusion Zone, which is about two hours' drive from the city and close to the Belarusian border. Back on the 26th April 1986 the Number 4 nuclear reactor at Chernobyl exploded with catastrophic consequences. Since then an Exclusion Zone has been in place around the plant and nature has reclaimed the towns and vehicles left within this. The accident was the result of a flawed Soviet reactor, operated by inadequately trained staff that had been ordered to carry out a poorly planned test. There were four reactors and a further two being constructed when Reactor 4 exploded twice, killing two workers and releasing at least 5% of its radioactive core into the atmosphere. A further 28 fire fighters died of radiation poisoning following the accident. At the time this was the largest uncontrolled radioactive release recorded. The city of Pripyat was built three kilometres from the site to house the plant's workers and their families and, at the time, it had 49,000 inhabitants. Within a 30 kilometre radius of the power plant, there was a population of up to 135,000 people. All were evacuated after the accident and most of these towns and villages including Pripyat are now ghost towns. Surprisingly after the accident the other reactors at Chernobyl were restarted. Their safety was improved but due to energy shortages the last reactor wasn't turned off until December 2000. In 2011 Chernobyl was declared safe enough to be recognised as a tourist attraction. Reactor 4 was enclosed in a large concrete shelter which was erected quickly after the incident and contained around 200 tonnes of highly radioactive material. The old shelter only had a shelf life of 30 years and at the end of 2016 a huge 'New Safe Confinement' structure was built on the site and moved into place over the old shelter. It is the world's largest movable structure and inside a team of robotic cranes is taking the old shelter and radioactive core apart in an effort to make the area safe again. On our first day of discovery with a local guide we will explore Pripyat including the fairground, hospital, hotel, bus station, fire station, football stadium, sports centre, elementary school, kindergarten, police station, Palace of Culture, church and the 'bridge of death'. We'll also see the Red Forest and the structure around Reactor 4. The attractions seen in the Chernobyl Exclusion Zone may vary depending on local conditions and restrictions, but we'll see the most possible during our two days spent here. This evening we will have the unique experience of staying within the Exclusion Zone in a small hotel within the town of Chernobyl. The bedrooms are simply decorated and there are three bathrooms shared between every five bedrooms. There is a restaurant and bar where we will enjoy a traditional Ukrainian meal this evening. Please note that it is essential that you provide Explore with the correct passport information at the time of booking and that you check this is accurate on your booking confirmation/the online customer information gateway, as this will be required in order to request the permissions needed to enter the Chernobyl Exclusion Zone. Corrections and amendments may incur additional charges at your own expense or result in you being denied entrance to the Exclusion Zone. If you intend to renew your passport please let Explore know at the point of booking and ensure that you have your new passport no later than 10 weeks prior to travel. Today we will most likely see Pripyat's swimming pool, grammar school and music school and visit the secret Soviet Duga Radar Facility. The radar military base was named Chernobyl 2 and didn't appear on any civilian maps and the trees were strategically planted to block the view from the neighbouring towns. There are two radars here that were constructed as part of a Soviet early missile detection system. The bigger of the two is almost 500 metres long and around 150 metres high. Also on the site are an abandoned fire station, small power plant, hospital and apartment buildings where the military personnel stationed here and their families would have lived. We will also hopefully get the chance today to speak with people still living within the Chernobyl Exclusion Zone, who are known as self-settlers. A year after the accident over one thousand people returned to their homes and despite efforts from the authorities they kept returning until eventually being allowed to stay and they have been living off grid ever since. Many of the people who choose to return were retired at the time and since it has been over 30 years since the disaster many of these people have sadly now passed away, so many of the towns and villages in the Exclusion Zone now only have one or two people living there. We should be able to meet with a couple of the self-settlers to hear their stories of what their lives were like before, during and after the explosion. Late this afternoon we drive back to Kiev for our final free evening in the city. Moldova has a temperate continental climate. Summers are generally hot, sunny and less humid than in Central Europe, with temperatures normally between 20 to 23°C. Winters are cold and snowy with temperatures averaging between 0 to -6°C. Short thunderstorms can occur in June and July, but rainfall in Moldova isn't abundant. Tour to Mezhygiria operates on day 13 for around 4 hours and includes transport, local guide and entrance fee, 840 UAH per person (minimum 4 passengers). Tour to Pyrohiv Open Air Museum operates on day 13 for around 3 hours and includes transport, local guide and entrance fee, 700 UAH per person. Lavra Monastery Complex visit operates on day 13 and includes the caves, Museum of Miniatures, Museum of Historical Treasures and Holy Trinity Church, 1500 UAH per group up to 10 people or 150 UAH per person if there are 10 or more participants. Odessa Catacombs including local guide, operates on day 4 from around 14.00 for 2.5 hours, 700 UAH per person (minimum 4 passengers). Number 411 Coastal Defence, operates on day 5 for around 3 hours, 700 UAH per person (minimum 4 passengers). Day trip to the Dniester National Park, operates on day 5, includes 3-4 hour bird watching boat trip, local guide, transport and entrance fee, 1,260 UAH per person (minimum 6 passengers). Odessa markets tour to the Flea Market, Privoz Market and Seventh Kilometre Market, operates on day 5 for around 6 hours, includes local guide and transport, 900 UAH per person. Entrance to the Army Museum in the Centre of Culture and Military History, operates on day 7 for around 1 hour, 40 Moldovan Leu (MDL) per person. Full day excursion to Verkhovyna, operates on day 9 and includes transport (the drive is around 2.5 hours each way), a short hike with a local guide, Hutsul Museum entrance and seeing cheese made by a local family. 6700 UAH per group plus 300 UAH per person. Full day excursion to the Caves of Ternopil, operates on day 9 and includes transport (the drive is around 3 hours each way), local guide, lunch and visiting three caves - Crystal, Verteba and Monastyrok. 5000 UAH per group plus 200-250 UAH per person. The caves are lit and there's no need for special equipment for this visit. The temperature in the caves year round is above 11 Celsius, so you should dress accordingly. Brewery visit, 100 UAH per person. Chocolate Master Class operates on day 12 for about 1.5 hours and includes a local guide, 420 UAH per person (minimum 5 passengers). This needs to be pre-booked at the start of your trip with your Explore Leader. Lytschkiv Cemetery operates on day 12 for about 2 hours and includes a local guide, 420 UAH per person (minimum 5 passengers). Tour of One Street including the Palace of Leon Sapieha, Museum Prison on Lontskoho and Lviv Citadel, operates on day 12 for about 3 hours, 1,500 UAH per group. July and August are the hottest months and lightweight cotton clothing is best. During spring and autumn temperatures can be lower or drop during the evenings and there is also a stronger possibility of rain, so pack layers. Rainwear may be needed at any time of year. A warm fleece/jacket is recommended for cooler evenings. During winter you should be prepared for snow and very cold temperatures, so it's advisable to dress in warm layers of breathable fabrics. You'll need waterproofs and plenty of warm clothing including a warm waterproof jacket (such as a ski jacket), jumper, fleece, gaiters or ski trousers, thick socks (including spare pairs in case your feet get wet) and thermal underwear. All visitors to the Chernobyl Exclusion Zone must wear full length trousers (not shorts or skirts) and long-sleeve shirts/jackets and please avoid clothing with lots of zips or metal poppers. It's advisable to wash your clothes and to shower after your visit. We also recommend that you take old clothes that can be easily washed or even thrown away if necessary and a plastic bag to keep them separate from the rest of your clothing following the visit. Upon leaving the Exclusion Zone you will go through a monitor to check the radiation level on you, occasionally this reading may come back too high, and in which case, you may have to leave an item of clothing behind, as you won't be able to take anything that gives too higher reading outside of the zone. Women should bring a headscarf for religious site visits. We recommend taking comfortable walking shoes for exploring and trainers or sandals for relaxing. If travelling in winter then your walking shoes/boots should have sufficient grip for icy conditions and be waterproof in case of snow. You may wish to bring a spare pair in case your feet get wet and your boots don't dry out overnight. In the Chernobyl Exclusion Zone you must wear closed toed shoes (not sandals or flip flops). We recommend using older shoes that can be easily washed or thrown away if necessary. In the Exclusion Zone there is often broken glass on the floor, so it is important to have shoes with sturdy tread. You may also want to bring a pair of slippers for your stay at the Chernobyl Hotel and on the overnight train, for going to and from the bathroom at night. This trip is at a full on pace, including a train journey with shorts walks and/or stairs between platforms, stations and accommodation, so for this reason please take care to make sure you can comfortably carry your own luggage throughout the trip. We advise taking a water bottle for our included walks, sun glasses, sunscreen and a sun hat are all essential. An umbrella may also be useful at anytime of year and gloves, a woolly hat and scarf if you are travelling in autumn or winter. Whilst in the Chernobyl Exclusion Zone we recommend carrying wet wipes, hand sanitiser, toilet roll and mosquito spray. We would also recommend buying any bottled water required before entering the Exclusion Zone. Please remember that you must keep your passport with you at all times, so you may find keeping it in a sealed plastic bag useful. For the overnight stay in Chernobyl it is best to take a small overnight bag with you and to leave your main bag padlocked in the luggage storage facility at our hotel in Kiev. During autumn and winter especially, the evenings can be cold and the heating at the hotel in Chernobyl is limited, so we'd recommend bringing warm nightwear and perhaps a blanket and hot water bottle. In case of emergency we also recommend that you carry a torch with spare batteries and sufficient medical supplies including a first aid kit and several days extra supply of any specific prescription medications that you require. You may find a head torch handy for on the overnight train journey. Moldovan Leu. The de facto currency in Trans-Dniester is the Trans-Dniestrian Ruble. Moldovan Leu can only be exchanged for Trans-Dniestrian Ruble whilst in Trans-Dniester. Attempting to pay for purchases in Trans-Dniester in any other currency is considered an illegal act. The most widely accepted currencies for exchange are US Dollars (USD) and Euro. Notes should be in perfect condition or may not be accepted. It's not always easy to change Pound Sterling. Major towns and cities have ATM's for cash withdrawal; although cash machines often do not work so please do not rely on them. ATM's in Trans-Dniester don't accept foreign bank or credit cards. In major restaurants and hotels in Chisinau. Outside the capital it won't always be possible to pay by card. Travellers cheques are very difficult to change in and Moldova. For the overnight train journey we will use sleeper carriages with four bunk beds and bedding provided (two beds on floor level and two above) per compartment and with a shared toilet and wash basin in each carriage. There are no shower facilities on board. Luggage is stored under the bottom bunk beds and above the cabin door for the top bunks. There is the possibility that you will be sharing with non-Explore clients in the same cabin and in mix gender cabins. There is no air-conditioning on board and it's not always possible to open the windows, so we recommend light weight bed clothes. You can experience authentic rail travel with the local people and it's a great way of getting from place to place during the night, so that you maximise on the amount of time you have in each city during the day. Take snacks, drinks, toilet roll, hand sanitiser and an open mind with you for maximum enjoyment. We will have checked out of our hotel on the morning of day 12 and won't be able to check in to our next hotel until the afternoon of day 13, so we will have two day rooms (one male and one female) to share between our group to freshen up on the day before and day of arrival of our train journey. We spend one night within the Chernobyl Exclusion Zone at a simple hotel with three bathrooms shared between every five bedrooms. Bathrooms are equipped with a sink, shower and toilet. Bedrooms are simply decorated. The food served here will be traditional Ukrainian cuisine and there is a bar within the restaurant. In the evening the doors of the hotel will be locked at around 22.30 and we are not permitted to venture out into the Exclusion Zone without our guide being with us at all times. The television service here includes no English speaking channels, so you might like to bring a tablet computer, electronic reading device, MP3 player or pack of playing cards with you for evening entertainment. Ukraine and Moldova: UK, Canadian and US citizens do not require a visa. Australian and New Zealand citizens do need a visa to enter Ukraine. Other nationalities should consult their local embassy or consular office. In addition you will be required to carry a photocopy of your passport with you at all times in Ukraine for ID purposes. It is essential that you provide Explore with the correct passport information at the time of booking, as this will be required in order to pre-book any applicable train tickets and Chernobyl Exclusion Zone permissions. Corrections and amendments will incur additional charges, so please double check that the information we have for you is up to date and correct, this includes your passport number, full name as per passport (including middle names), date of birth and place of birth; if customers renew or reissue their passports from the details initially given to Explore, train tickets must be cancelled and purchased again, which involves extra costs and may result in customers being in differing train carriages to the rest of the group. If you intend to renew your passport please let Explore know at the point of booking and please ensure that you have the new passport no later than 10 weeks prior to travel. This trip is designed to show you the highlights of two countries, so the pace is full on. We'll be using public transport as well as charter buses to get around and we will do most of our exploring on foot in each place visited. Please pack light to ensure you can lift and store your bag on the overnight train (soft sided bags with wheels work best). We have a few long journeys which will mean early starts, but of course there's always the option to catch-up on some sleep whilst on the bus. The exact timings for these days will depend on the road and weather conditions. On these days it's best to bring snacks and drinks with you and we'll either have an early breakfast at our hotel or our Explore Leader will arrange for us to have a packed breakfast to take with us on the bus. Whilst in the Chernobyl Exclusion Zone there are a number of rules in place to ensure your safety and it's very important that you follow all instructions given to you by your local guide. Every visitor must have a valid passport with them at all times and in order to be permitted entry to the Exclusion Zone you must be at least 18 years old. This restriction is due to the fact that the human body is still growing below this age and it's therefore more vulnerable to the effects of radiation. During the two days we spend in the Exclusion Zone you'll receive a dose of radiation comparable to a small dose from an X-ray scan or to several hours spent in an airplane at altitude. In numbers, you will receive 5-7 micro Sieverts of gamma radiation, which is a non-harmful dose of radiation. To put this into context most nuclear power plants around the world set a safety limit for their employees of 50-100 micro Sieverts per day. Whilst in the Exclusion Zone all our meals will be included to ensure they're from a safe source. You are not allowed to smoke, eat or drink in open spaces whilst here. You are not allowed to eat any berries or drink water from open sources such as wells (tap water or bottled water is fine). In the Exclusion Zone you are allowed to take photographs and videos of everything and can take tripods with you. The only exceptions are restrictions at the Chernobyl Nuclear Power Plant and the guarded checkpoints. You are allowed to take pictures and video in front of Reactor Number 4 from a safe distance. Your guide will advise us of any places where photos aren't permitted. In the Exclusion Zone there may be rubble underfoot and not all stairs will have banisters, so you need to be steady on your feet. Please wear shoes with good grip and that support your ankles. We've been notified that the Chernobyl Exclusion Zone is occasionally being closed to tourists in order to be used as a training area by the Ukrainian military. Whilst this has only occurred three times in the past three months and hasn't yet affected any of our departures, we felt it was important to notify you of the small possibility that this could happen on your trip. In the majority of cases we will be notified two months in advance by the military of their intent to close off the Exclusion Zone. If we know this far in advance then we will endeavour to change the date of the trip or to alter the itinerary, so that we are still able to visit the site, as we understand that for most visitors this is the highlight of their holiday. Of course if we do need to change the departure date once you have booked your trip then we'll inform you as quickly as possible. Should you decide that you're no longer be able to travel on the new departure date or any alternative trip date, then you'll be entitled to cancel your trip and receive a full refund of the monies paid to Explore, though we hope that you will not find this necessary. 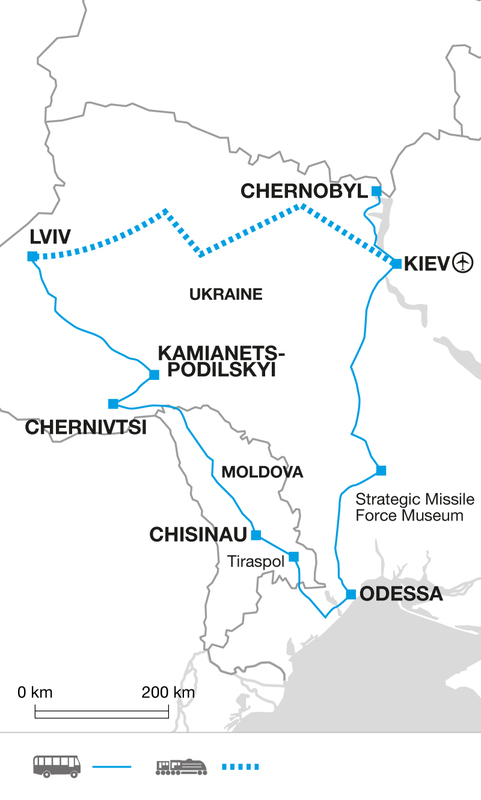 Should the military not notify us of their intent to close the area within a reasonable time frame for us to amend your itinerary as per above - then we'll stay in Kiev for an additional night rather than overnighting in the hotel in Chernobyl. During the two days that we'd normally be in the Exclusion Zone, as an alternative we'll go to visit the Mezhyhirya Residence Museum - the lavish property where Ukraine's controversial former president, Yanukovych resided before the 2014 uprising. It now houses the Museum of Corruption. We'll then get to participate in a varenyky making master-class. These dumplings are a Ukrainian speciality and come with a range of different fillings. On the second day we'll visit the Lavra Historical and Cultural Reserve and take a guided tour of the remarkable Monastery of the Caves founded in AD 1051, where the labyrinths provide all the natural conditions needed for mummification. the Pirogov Open-Air Museum of Wooden Architecture, which is about 40 minutes' drive from the city. Set on the banks of Lake Myachino we'll be able see a variety of old Ukrainian village houses, chapels and churches that have been preserved to display how people used to live. Nothing compulsory, but we recommend protection against hepatitis A and diphtheria. Check that your polio and tetanus vaccinations are up-to-date before travel. The UK Foreign Office currently recommends that you should consider whether to immunise against tickborne encephalitis and rabies. Please check the latest requirements with your travel clinic or doctor prior to departure. The above is not an exhaustive list. Further information regarding vaccinations and travel health advice can be found by following the NHS and NaTHNaC links at Explore Travel Health and from your local healthcare provider. Visa and vaccination requirements are subject to change and should be confirmed by you before travelling. In 2017 we successfully operated a brand new one-off Beyond recce trip to lesser visited Ukraine and Moldova. Following on from this we've taken the feedback we've received from our customers and Explore Leader and have created this trip, which takes in the most unique and exciting places found in these two distinctive countries. Please note that in order to be permitted to enter the Chernobyl Exclusion Zone and to travel on this holiday you must be at least 18 years old.